100 Economy Blocks all pieced together into a quilt top. 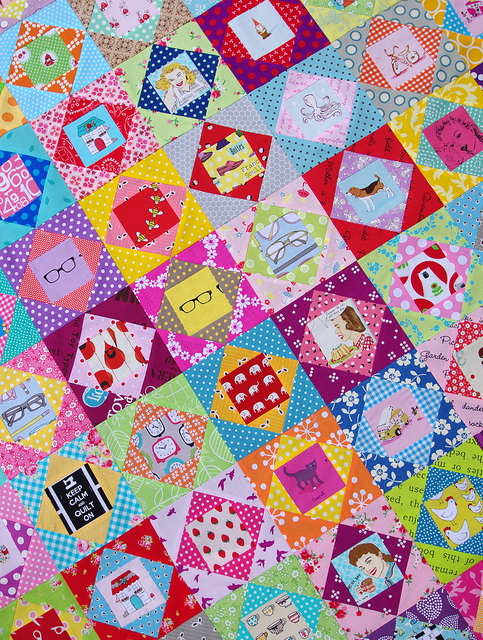 900 patchwork pieces. The blocks were sewn over a two day period and I did have to push myself to keep going. I watched all of Offspring Season 1 on DVD - 11 hours of Australian TV drama, and I enjoyed a quiet house as my boys traveled to Sydney for a few days to watch the Aussies win back the Ashes (cricket). All of my fabrics were already cut and I made my blocks work with the fabrics that were there. I tried not to over think the fabric selection, but it sure turned out to be a cheerful quilt. There is a lot to see. 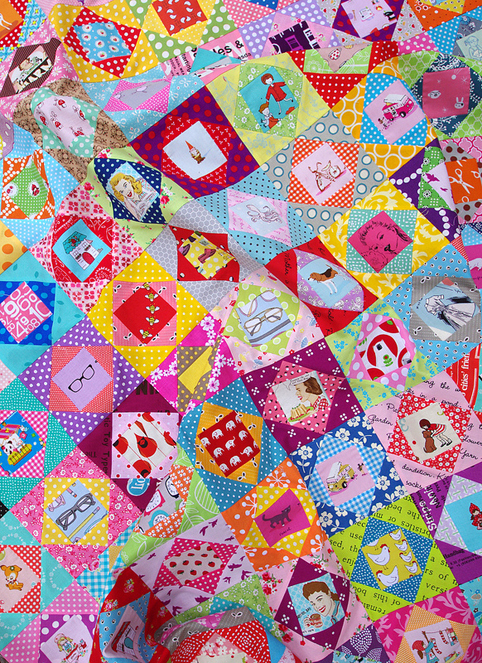 I am thrilled to see all of the different Economy Block Quilts that are in progress: see the hashtag #economyblockalong on Instagram or see the Economy Block Quilt Along Flickr Group for ideas and inspiration. I have made a lot of progress since these photos were taken and hope to show you the finished quilt in the next few days. If you have any questions regarding the quilt-along please don't hesitate to ask or add to the discussion forum on the Quilt-Along Flickr Group. You can join at any time. Make as many or as few blocks as you like, and use fabrics of your choice. No pressure, happy sewing. Wow! What a GORGEOUS quilt! I just can't stop looking at it, it is so lovely. What talent! Looks just great! Colours work together very well! How do you sew and watch tv at the same time? I think I could never do so. Just beautiful! I love it! A day of just sewing sounds wonderful... I have to sneak my time in when the 4 little ones go to bed. I am falling in LOVE with these blocks! A great classic, but so fresh, updated & cute! I'm having so much fun with mine, yours is turning out beautifully! Wow! I LOVE all the fussy cut pieces and vibrant colors! This quilt is so much fun! I love all the colors and patterns and the pictures that are fussy cut! I want to make one, I just don't know if I have all the patience to do all that cutting! This is a favorite! Can I say that again and again about your quilts? 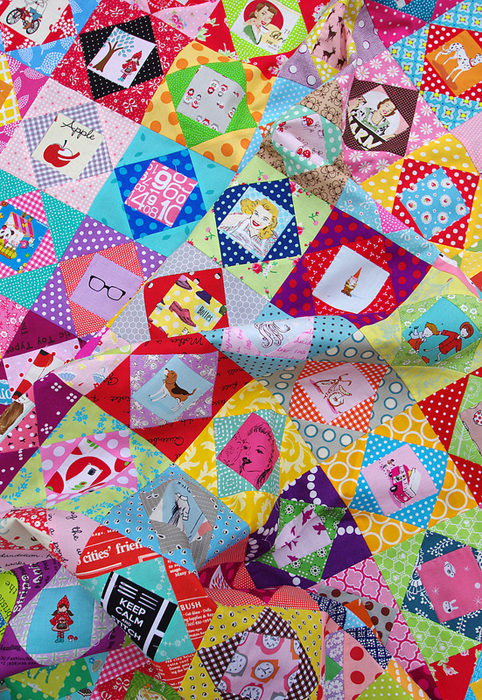 I love the " I spy " feel of this quilt...I am thinking that picking out and fussy cutting the center blocks would be the one thing that took the most time... Like weeks, months, hey even years to collect all those little motifs. You where watching a show I love to listen to audio books when quilting... driving...weeding the garden! I get a lot more done and can cover 1000 miles a day driving when I need to with an audio book going. I love your work....you make color selection look flawless!! So, so gorgeous! Brilliant colours. wow I love this! the COLOR is so vibrant! just wonderful : ) maybe I'll use this theme for my bee block request. thinking it would make a fabulous "I Spy" for a little one! Love it. This is such a happy quilt! Super-900 pieces. I am glad my chair has arms or I would have fallen out of it when I read that number. However, it's certainly a fine quilt and you have reason to be proud-Again of your creations. Congrats on another winner. you have one this so quickly a lovely set of blocks. Least said about the cricket here in the UK the better, At least I can now sleep through the night instead of listening to it on the radio! It's beautiful! I love all the polka dots. Yay to Australia winning the Ashes!